The future is not just somewhere we go, we create it. Governments, businesses and individuals alike play an active part in shaping tomorrow’s world through the actions and choices made today. When we look back on the evolution of society, this has not been a nice even curve of constant progress, but rather, a bumpy journey of lessons to be learned. The economist Keynes predicted that by 2030 we would only be working 15 hours a week, as we would: “have enough to lead the good life”. Evidently this hasn’t happened, so the question today is: “who sets the measure of what is enough?” One of our main challenges is that of over-consumption, and the quest for Efficiency and Connectivity clearly collides with our pursuit of The Good Life. We see a situation where the ‘GOOD’ life is confused with a life full of ‘GOODS’. So how do we mend the imbalance caused by over-consumption to establish an ethical business model? Open-mindedness requires a paradigm shift in our values. A global consumer survey of 50,000 people by Havas Media has found that only 20% of brands are perceived to have a notable positive impact on our sense of wellbeing and quality of life. In the UK, that number sinks to just 5%, and most people wouldn’t care if 90% of brands disappeared. With that in mind, it is time to rethink our business models to match people’s real expectations. What I am talking about is a holistic economic model that embraces a 4P bottom line: People, Planet, Purpose and then Profit. One thing is clear, governments and businesses need to adopt a 4P bottom line to create an engaging narrative and brand image that resonates with people’s values. The Trend Atlas is my system for decoding the socioeconomic and cultural content of today’s world to identify key drivers of change. 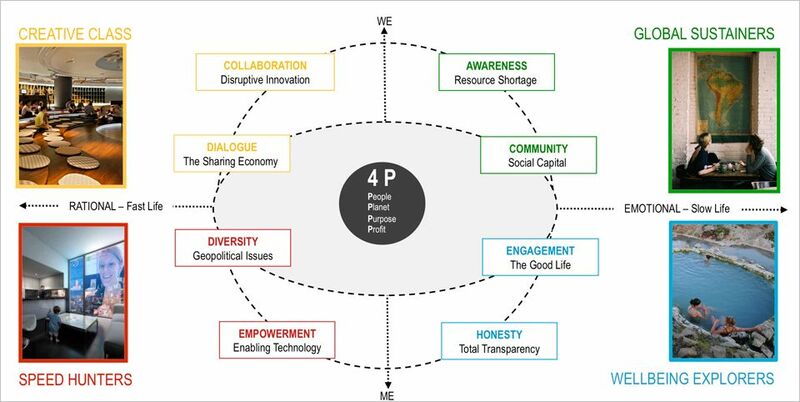 It delivers an inclusive outlook of the Scientific, Social, Emotional and Spiritual drivers and enables organisations to develop authentic and effective 4P approaches. Ethical Consumption is essential to tomorrow’s world, but it requires the aforementioned paradigm shift in thinking to bring societies, businesses and people together. To realise this vision, we need to understand the fundamental ‘Building Blocks’ of change. 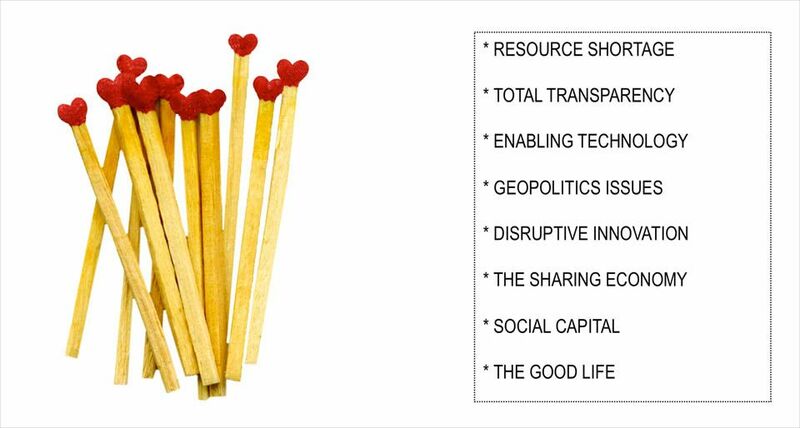 These drivers (see illustration) are in fact all inter-connected and essential to creating a holistic outlook. In the future, businesses must act as facilitators and enable people to achieve ‘The Good Life’ through open dialogue about sound ethics and meaningful lifestyle choices. All the trends illustrated are relevant since change in society influences our behaviour in different ways. This means tomorrow’s successful organisations must target both ME and WE People equally, developing strategies for both rational and emotional value chains. People engage with contexts and values relevant to them and companies must respond by embracing diversity in its fullest sense. In a Rational context, key values are: Diversity and Dialogue. In an Emotional context, key values are: Community and Engagement. An ethical business model must, at its heart, have a 4P bottom line: People, Planet, Purpose and then Profit. Relying on traditional measures of growth is not only unsustainable for our environment, but also for human wellbeing. To succeed, it makes sound business sense to start with a strategy of maximising social value and conditions for human happiness within the planet’s capacity – also considering our consumption and production patterns. There is growing evidence that we can thrive using different models and a 4P vision enables us all to grow – societies, businesses and people. What is the future of death rituals and dying?